Thursdays are volleyball nights, and the nights that I have the most difficult time motivating myself to get on my bicycle. A normal days commute, a full day of work, 2 hours of volleyball, and a 10 mile round trip to and from the volleyball gym, make it my most physical day of the week. 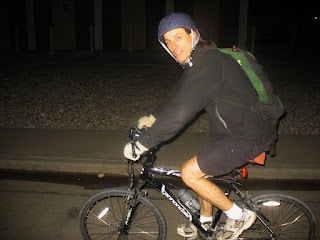 So seeing my friend and co-worker Dan on his bicycle and being able to ride part of the way home with him after volleyball makes things a bit easier and more fun.